To let the user write his own scripts to control the RTC program, I needed a scheme which would read in a script written in a (fairly) simple control language. That script would be able to send commands to the TIU. Searching on the Internet turned up several possibilities. I was amazed that people had written the program to handle a script language. Its a lot of work. Lua (/ˈluːə/ LOO-ə; from Portuguese: lua [ˈlu. (w)ɐ] meaning moon)[a] is a lightweight, multi-paradigm programming language designed primarily for embedded use in applications. Lua is cross-platform, since the interpreter is written in ANSI C, and has a relatively simple C API. Lua was originally designed in 1993 as a language for extending software applications to meet the increasing demand for customization at the time. It provided the basic facilities of most procedural programming languages, but more complicated or domain-specific features were not included; rather, it included mechanisms for extending the language, allowing programmers to implement such features. As Lua was intended to be a general embeddable extension language, the designers of Lua focused on improving its speed, portability, extensibility, and ease-of-use in development. For information, the other scripting language I looked at was AngelScript. My selection of Lua was that Lua had been compiled using the Borland/Embarcadero C++ compilers. After some testing, I found that I could link the lua code with the RTC code that I've written. I probably could have gotten AngelScript to link if I spent more time on it. Lua is a powerful, efficient, lightweight, embeddable scripting language. It supports procedural programming, object-oriented programming, functional programming, data-driven programming, and data description. Lua combines simple procedural syntax with powerful data description constructs based on associative arrays and extensible semantics. Lua is dynamically typed, runs by interpreting bytecode with a register-based virtual machine, and has automatic memory management with incremental garbage collection, making it ideal for configuration, scripting, and rapid prototyping. Lua can do very complex things. We only need a small subset of what it can do. I'll describe some of the language below when I show a coding example. The RTC program is written in Borland/Embarcadero C++. It was easy to link the Lua library into RTC because of all the work done by others and released on the Internet for free use. Lua is an embedded language. This means that Lua is not a stand-alone application, but a library that we can link with other applications to incorporate Lua facilities into them. I created a new window on RTC titled "Program Control". The button to open the window is [Prog Ctrl]. On that window, you can select the script file, run it, and monitor its progress. The script language is similar to C or Pascal. You can use the scripting language with or without using my RFID train detectors. when is the time in seconds in the future to send the command. It can be 0.0 to 9,999.0 seconds. RTC rounds the value to the nearest tenth of a second. Any function called with "when" greater than zero is put into the dispatch list for future execution. Use of this parameter in a function call does not move time forward. Only the Sleep() function moves time forward. EngineNo is the target engine number, 1 to 99. LashupNo is the target lashup number, 101 to 120. TIUNo is the destination TIU number, 1 to 5. Setting() sends the "ab" command with value iSet (Look at the commands here). Schedule() sends any Command passed to it. For example "u2", "w4", "s010", etc. (Look at the commands here). bState and bDIR and bCoupler use the definitions in the "defines.lua" file. Typically words like ON or OFF, STRAIGHT or DIVERGE, CLOSED or THROWN, FORWARD or REVERSE, FRONT or REAR. iSoundNo is the index into the sound file of the sound to play. See the page on the ADPCM program. -- requires dofile("defines.lua") to define these constants. -- set the Level(0-100) of the channel given by Chan. NOTE: Any command with a "when" parameter may take 1-2 seconds to complete. If you need to "Get" the result for confirmation, you should Sleep() for a few seconds. -- use a floating point specifier like "%.2f". -- two calls as an elapsed time. -- used by the RTC program. Returns true or false. RAM(address, Engine, TIU); -- returns the byte at the RAM address given as address. -- The first 1024 bytes (address 0x000 to 0x3FF) can be read. -- You can download my documentation for this function here - Engine RAM Mapping.pdf. -- to the nearest 0.1 of a second. -- Sleep() is the only function that moves time forward. -- you are exiting on an error condition. -- to wait for the dispatch list to empty on an error condition. -- press [Cancel] to use the default value. Returns the result as a string. -- given engine or lashup on the given TIU. -- engine 4 (running in reverse) is the trailing engine. -- active engine on the given TIU. -- Delay is the time between each engine's action (for dramatic effect) and can be omitted. -- button or switches will move just as if someone manually activated them. -- the engine was started with StartUpActiveEngines()or EngineStartUp(). The script files are plain text. To edit them, you can notepad, metapad or Notepad++. The latter does syntax highlighting and knows the syntax of Lua. setup(Engine, TIU, Debug) -- is called once at the start, it is passed the engine number (1-99) and TIU number (1-5) from the main RTC window and the debug level (0-9) from the Debug window. If you don't know how to access the debug window, send me an email. Value is 0 for no debug to 9 for maximum debug information. Return true on success, false on failure. tag(Detector, Reader, EngineNo, TagLocation, CarType, TagPacket) is called each time a packet is detected by the RFID tag readers. Requires the RFID Train Detection system to be enabled on the setup window. On the Setup window, the check box for [X ] Enable RFID must be checked. Passes in the detector number, the reader number, three decoded fields from the tag packet received and the complete tag packet itself from which you can decode the other fields. Detector - the detector number as coded into the Arduino sketch. Starts at 1. The RFID system can support up to 127 detectors. Reader - the reader number, starts at 0. Each detector can support up to 6 readers. EngineNo - the engine number as coded into the tag. Zero if the tag is not on an engine. TagLocation - the location of the tag as coded into the tag. Look at the RTC_NFC.h file for values. CarType - the car type as coded into the tag. Look at the RTC_NFC.h file for values. TagPacket - the entire packet of information returned by the detector. 4 bytes of UID followed by 16 bytes of Block 4 data coded into the tag. Look at the RTC_NFC.h file for values. Return true to continue accepting tag detections, false to quit accepting tag detections. Note that this tag() function is not passed a TIU number or debug level. if you need that information, save the values passed to the setup() function in global variables like MyTIU, and MyDebug. 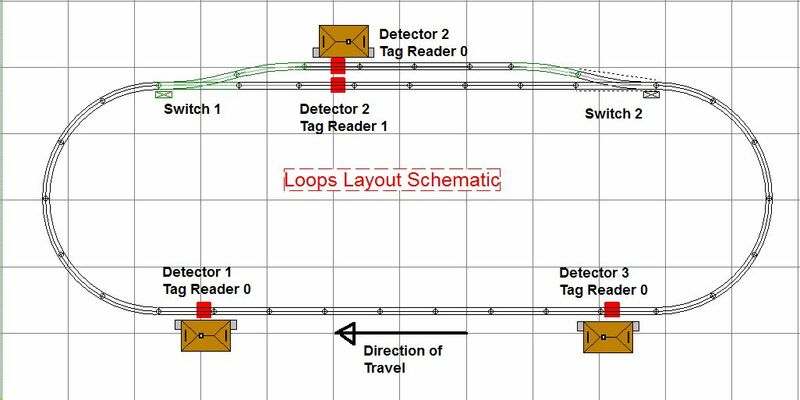 loop(Engine, TIU, Debug) -- can be used when the RFID tag system is not active. This function is NOT called during setup() or cleanup(). This function is called over and over as long it returns true. Return false to break out of the loop. If the function does not appear in your script, RTC does not attempt to call it. On the Setup window, the check box for [ ] Enable RFID must not be checked. loop() will use up 100% of the CPU when it is called over and over. If this function returns true, you should always call Sleep() at least once to give other parts of RTC time to run. tick(Engine, TIU, Debug) -- is called once per second. It is passed the engine number (1-99) and TIU number (1-5) from the main RTC window and the debug level (0-9) from the Debug window. Value is 0 for no debug to 9 for maximum debug information. This function is NOT called during setup() or cleanup(). Return true on success, false on failure at which time the tick() function will no longer be called. Note: RTC does not guarantee this routine is called exactly once per second. If RTC script processing is extensive, a tick may be skipped. Always use RunTime() to get the exact time. If the function does not appear in your script, RTC does not attempt to call it. Do not call the Sleep() function from this function. cleanup(Engine, TIU, Debug) -- is called once when the user presses the [STOP] button on the Program Control window. Return true on success, false on failure. If the function does not appear in your script, RTC does not attempt to call it. If you are running this without using the RFID tag readers, just put all of your code in the loop(Engine, TIU, Debug) function. start with two dashes and two left brackets. title = "Counter and Function Label Test"
This script shows the use of two configuration variables, "title" and "author". If you assign strings to these variables, they are used to add a meaningful description to the Program Control window. In this example, the Program Control window will display Counter and Function Label Test (Mark DiVecchio). To use the tick() function, just define it in your script. The listing of the script is in the box below. I'm not going to describe everything that you see there but I'll try to point out the major points with comments in the code. dofile(filename) is called twice in the script. This call reads in the script in the named file and processes it as if it were included here. Scripts using the RFID tag readers requires two other files : "defines.lua" & "functions.lua". They are shown below also. Note that the "functions.lua" file is only needed if you are processing my RFID tag system. print(string) displays the string on the Program Control window's message box. Used to monitor the progess of the script and to show its status. This example does not use the RFID tag readers. On the Setup window, the check box for [ ] Enable RFID must not be checked. When you press the [Run Script] button on the Program Control window, the setup() function is processed followed by the loop() function. setup() is run once and loop() is run over and over asl long as it return true. Return false to break the loop. When you press the [Stop] button, the cleanup() function is run. The Sleep(Delay) causes the script to pause for the given number of seconds. This file is part of Remote Train Control. 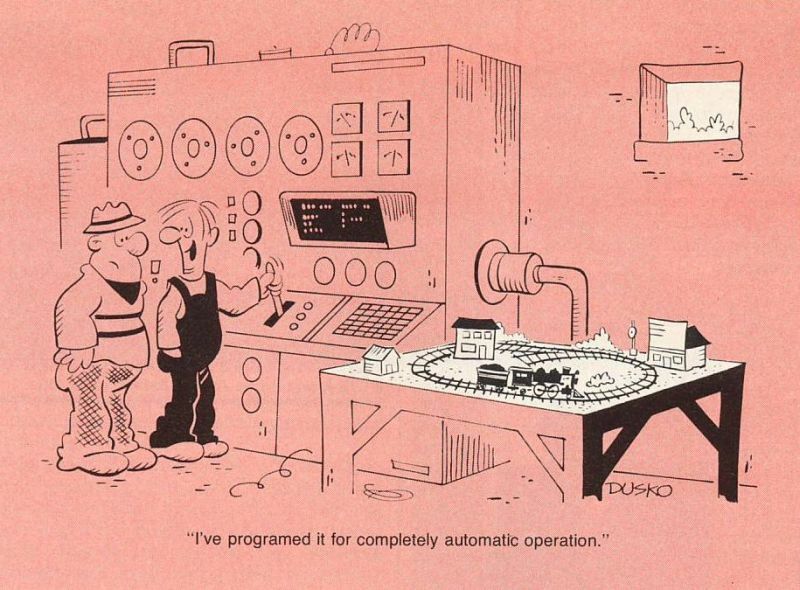 along with Remote Train Control. If not, see <http://www.gnu.org/licenses/>. Up to 10 special interactive functions can be defined. They are named "Function01" through "Function10". All ten functions can be accessed through the use of 10 buttons which appear on the Program Control window. If you press one of these buttons while loop() or tag() is running, the function will be executed after loop() or tag() completes. This line tells the Program Control window to put the words "NOP" on the button and when the user presses the button, to call the function NOP(Eng, TIU, Debug). Two counters can be defined and will appear on the Program Control window. Your script can increment these counters to display information to the user. They are named "Counter01" and "Counter02". They are bottom two counters in the column of counters at the right edge of the window. author = " and Tick Test"
For my first real script, I took the "Loop Demo" that I showed in the last few videos on my RFID Train Detection web page and converted it to a Lua script named "Three Engine Demo". The listing of the script is in the box below. I'm not going to describe everything that you see there but I tried to point out the major points with comments in the code. This real world example requires the use of my RFID tag detectors. On the Setup window, the check box for [X ] Enable RFID must be checked. The function tag() is called each time a tag is detected. Here is a schematic of the layout. The RFID tag readers are shown in RED. There are 3 Arduino detectors, two with a single RFID tag reader and one with two RFID tag readers. title = "3 Engine Demo"
-- should have exactly three active engines and the rest should be inactive. -- and located them on the layout, we can vary the movement times and running speeds. if (EnginesUsedNum[iDex] == EngineNo) then 	-- is the engine in the Engine List? -- The state machine will now loop over three states, READYGO_3, READYGO_3a, and READYGO_3b. -- Each state will move the engine up to the next detector and then stop it there. READYGO_3, READYGO_3a, & READYGO_3b These three states are basically identical so I will write one description. As each tag is detected, the tag() function is called and the state machine value (SM) will cause one of these states to execute. Tags from other non-engine cars are ignored. Knowing now the order of the three engines, the script will run the engines until each passes over one of the three detectors (1, 2 & 3). Then it stops the engine. When all three engines are stopped (at a detector), the script pauses for a few seconds and then the script starts the engines moving again at different random speeds. The three states detect the three engines over the three detectors. The state machine (SM) is set to the next of these states and waits for each of the three engines to run up to the next stopping point (at the next detector). So the state machine runs these three states in sequence over and over until the [STOP] button is pushed. cleanup() This function is called when you press the [STOP] button. It stops all active engines and terminates the script. GP7PFA() This function runs the PFA for a GP7. Called randomly during the running of the script. SW1200PFA() This function runs the PFA for a SW1200. In particular, the Aliquippa & Southern SW1200 #1208. Called randomly during the running of the script. RandomAction() This function runs a randomly selected sound or light action. This was done to just add some additional sound and light to the running of the script. SW1200() This function is called when the you press the [Function01] button (labeled: "SW 1200 PFA") on the Program Control window. It, in turn, calls SW1200PFA(). GP7() This function is called when the you press the [Function02] button (labeled: "GP7 PFA") on the Program Control window. It, in turn, calls GP7PFA(). defines.lua contains constants used the main script. functions.lua uses several functions called by the main script. These functions help in processing the RFID tags otherwise it is not needed. This scripting control fully supports lashups. Lashups use numbers from 101 to 120.
title = "Lashup startup shutdown Test"
Lua is an interpreted language that is compiled into bytecode before its run. If you have a very large Lua script, it may take some time to compile. You don't have to do this each time it is run. You can compile into bytecode, save the bytecode and have RTC run that bytecode. Use the "luac.exe" compiler. The compiler produces a bytecode file named "luac.out". Rename it to your script name, keeping the ".out" extension. Then you can selected that file from the [Browse] button on the Program Control window. If you use the "defines.lua" or "functions.lua" scripts in your main script, you must still have them available in your script folder or precompile them and change the call to "dofile("defines.out")". To get the compiler, look for the file "lua-5.3.5_Win64_bin.zip" (or maybe a newer version number) at LuaBinaries on SourceForge. You can download RTC v3.99 from here. Includes all of the above scripts and several more. This scripting will only work with version 4.0+ (or v3.99 beta) of the RTC program. I don't have V4.0 up on the web site yet (needs more testing), again, use b3.99 beta.